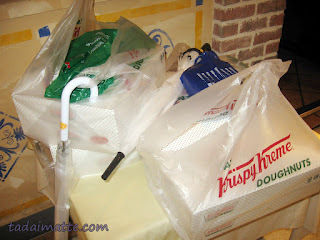 One of my first impressions of Tokyo was courtesy of Krispy Kreme doughnuts. 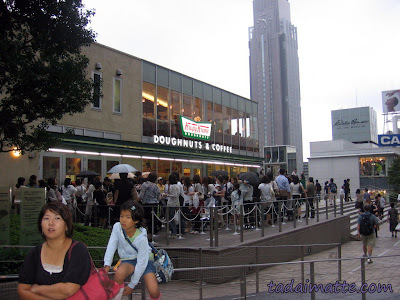 Rather, it was the Krispy Kreme doughnut frenzy personally witnessed at the Shinjuku Southern Terrace. 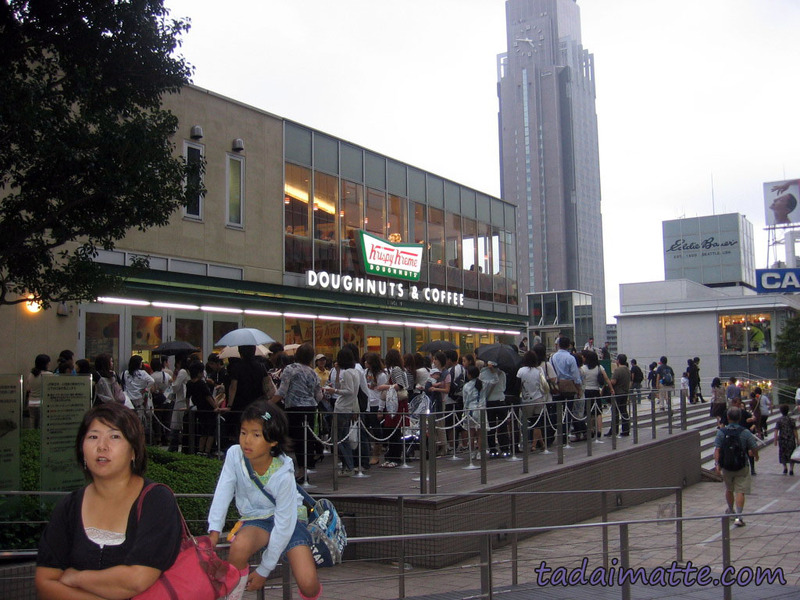 These people waited about 45-60 minutes for their doughnuts - in the rain! 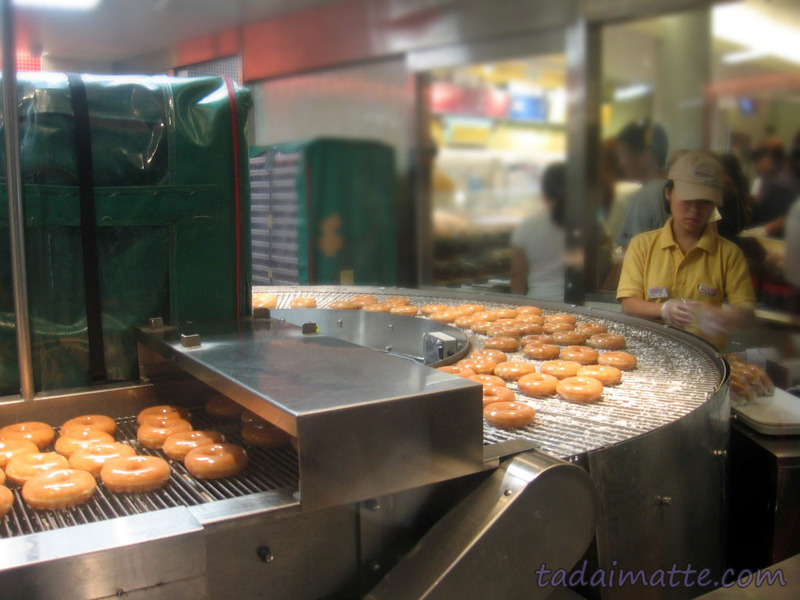 When I arrived in Japan, there was only one Krispy Kreme, and it was incredibly popular, as you might expect - the Japanese have an appreciation for trying new things, particularly when they are famous, particularly when it comes to food. They also have an affinity for standing in line - I'm told that after waiting in a long line to try something, you are more likely to be appreciative of your purchase by the time you reach the head. By the time I reach the head of a long line, especially an outdoor one, I'm usually murderous, but I'm not Japanese, so I can't claim to understand this one. At Tokyo Orientation, we received some information about the area around our hotel, including a map with a legend. Krispy Kreme was marked there, with a warning "First K.K. in Japan, very popular, expect a line." (They now have 27 locations, and counting!) Krispy Kreme had left Toronto some years before, and it had been a long time since I'd been able to have my favourite K.K. doughnut, the Chocolate Iced Kreme Filled, so I decided to head over there. I'd even read up on it on Wikipedia when I was trying to check out things to do in Tokyo - the store had been built almost a year before, so I figured the long lineups had probably petered out by now. Well...they hadn't. Even though it was already eight o'clock in the evening, when I found the place, the queue had fifty or more people in it. We were handed menus and free doughnuts in line, at least, and the doughnut creation process was just inside the window for us to watch while we waited. I didn't realize it at the time, but I was very fortunate to have gotten inside the store within thirty minutes of joining the line. Unfortunately, the cream-filled chocolate iced variety are not available in Japan, but I got a half-dozen other exciting new kinds, including a most excellent lime-filled powdered dougnut. The interesting Japan-only flavours are what kept me coming back each time I was in Shinjuku. Krispy Kreme Japan offers a fantastic seasonal menu that is always changing and is usually themed. (I couldn't get behind the coffee theme. Sorry, K.K.) Though I hated the fake-tasting fruit-filled doughnuts that used to come in a dozen from Tim Hortons, Krispy Kreme did these powdery little delights perfectly. If you happen to be lucky enough to be in Japan when Cassis or Lime flavours are on the rotation, don't miss them! The next time I was in Tokyo, for Tokyo Game Show 2007, I thought I would bring back Krispy Kreme as omiyage (souveniers) for my co-workers back in Osaka. However, this time the line was four times as long. When we came back later that night, we were lucky to get away with an hour-long wait. The funny thing is, every time I passed the Shinjuku Southern Terrace over the next three years, the queue was out the door - and sometimes stretching halfway back to the Takashimaya building. Yet when we visited their brand-new Shibuya location less than a month after its grand opening, there was almost no lineup at all - at ten a.m. on a Saturday! I suppose that even now, doughnuts are just not acceptable breakfast food in Japan!